Is Cold Weather Exercise Healthier? : Shots - Health News As a freezing winter drives many of us indoors, some extreme athletes embrace the cold as a great way to burn calories and retrain the immune system while working out. Not so fast, physiologists say. 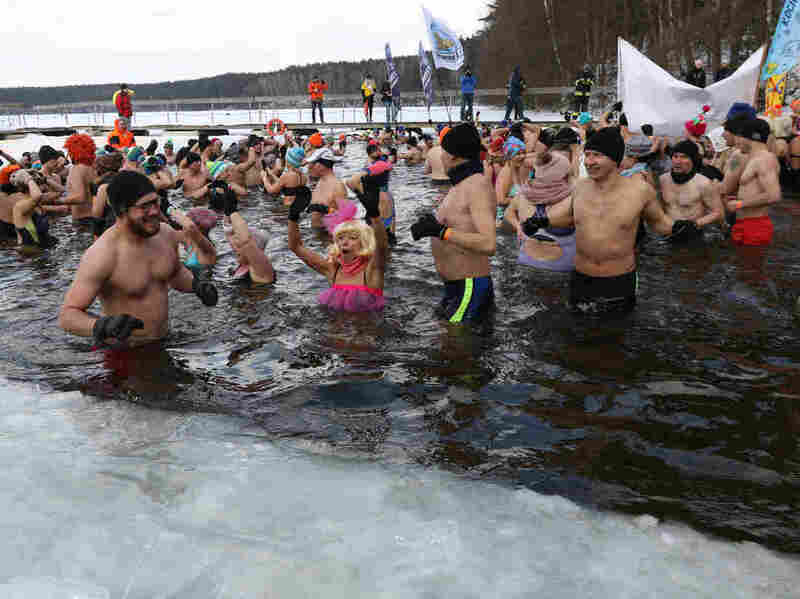 Winter swimmers enjoyed an icy dip in Poland's Garczyn lake last February. Recorded air temperature was around 14 degrees Farenheit, and a large ice hole had to be cut to allow the lake bathing. "I actually flew out there with the intention of debunking him as a fraud," says Carney, a Colorado-based journalist, author and senior fellow at Brandeis University's Schuster Institute for Investigative Journalism. But after learning Hof's methodology — a combination of meditation, breathing exercises and immersion in icy cold water — Carney became a believer. "In a matter of a few days, I was meditating on the bank of a snowy river in Poland in ridiculous, freezing winter, and melting the snow around me with my body temperature," Carney says. Carney details that experience in his book, What Doesn't Kill Us, which was released in 2017 and recently came out in paperback. "Our bodies need to be in constant variation," Carney says. "That's what keeps us healthy and fit." Many of the purported benefits of cold hinge on brown fat, sometimes referred to as "good" fat. Long known to exist in human infants, brown fat burns calories and generates heat. "The average person will burn an extra 100 to 200 calories a day when brown fat is activated," Kahn says. "But if you go eat half a muffin, forget it." And that "100 to 200 calories" figure is for someone who's chilly all day long, he says. Most people experience cold for only short periods of time. "When you activate brown fat, it may stay active for a few hours," Kahn says. "Not permanently." Kahn also warns that Hof's call for exposure to the extreme cold could be overkill. "What it takes to activate brown fat is very mild degrees of cold," Kahn says. "If I put you in a room at 60 or 62 degrees Fahrenheit and you're dressed in very light clothing, that's enough to do it." A second way that people can burn extra calories when they're cold is through shivering. But Kahn doesn't suggest that strategy, either, because shivering makes most of us miserable. "It's a way to burn extra energy," Kahn says. "But I don't think there's any data to say that this is a good way to lose weight ... because it's not comfortable." A side effect of exposure to the extreme cold that Hof calls for is vasoconstriction. When you're subjected to extreme cold, the muscles surrounding many of your blood vessels cause them to contract — sending more blood to your core, where it can stay warm. Carney says that because modern humans live in temperature-controlled environments, "all of that musculature is weak." Exercising those muscles through cold exposure, he claims, has "a huge impact on circulation and arterial health." "In terms of using [cold] as a way of ... 'training the blood vessels?' To my knowledge there's no data to support that claim," says Castellani. "We were looking at someone in one of our mild cold studies, and his blood pressure went really high," Cypess says. "That's not a good thing." One of Wim Hof's more startling claims — that he could consciously control his immune system — drew the attention of Matthijs Kox, a researcher at Radboud University Medical Center in the Netherlands. "At first we were a little bit reluctant, but then we started to look up all the remarkable feats he had pulled off," explains Kox. "So we decided to give him a chance to prove his claim." To put Hof to the test, Kox and his team injected Hof with a solution containing pieces of E. coli bacteria. Since the injection didn't contain live bacteria, it couldn't actually make Hof sick. But in most people, these bacterial compounds would fool the body into believing it is being attacked, triggering a temporary immune response that includes fever and inflammation. If Hof could indeed suppress his immune system, then the injection would have no such effect. Sure enough, Hof's body showed little reaction to the injection. "He had virtually no symptoms — which was remarkable," Kox says. Carney thinks that sort of suppression might benefit patients who are suffering from autoimmune disorders — such as forms of arthritis that are linked to the body's immune system essentially attacking itself. If people could suppress their immune system as Hof does, Carney contends, some could potentially cure themselves of those diseases. "We still have to test it, but it might be beneficial in conditions associated with an overactive immune response," Kox says. "But we need more work — more proof — to see whether this is really beneficial." But which component of Hof's training contributed to the outcome? Was it the cold exposure, or the breathing exercises and meditation? Kox says he can't tell from his findings, but he is currently supervising an experiment to find out. He expects those results to be published within the next couple of years. Until then, the value of cold exposure as a treatment for autoimmune disease remains largely unproven, if promising. The bottom line is, there is little evidence so far to suggest that training in cold weather makes you healthier, or that you can burn significantly more calories. The physiologists Shots talked to all agreed on one thing: There simply hasn't been enough research to say one way or another. Cypess says he isn't ready to dismiss the potential benefits. But until he sees more compelling data, he's not likely to suggest it as a therapy. He has a bigger priority. "The most important thing is to get the person to exercise," Cypess says. "There is no obvious added benefit to exercising in the cold."